You can totally grow lemon, orange and lime trees here on the wet, west coast of Canada, both in pots and in the ground. Our weather here on the west coast tends to be fairly mild in both winter and summer, but we can get snow and we do get cold snaps. Citrus trees do not tolerate freezing temperatures, they must be kept above 0°C. So how then to best protect them during a frosty cold snap? Contrary to popular belief, the answer is not to bring them indoors for the winter months, unless you have a cool sunroom or 'conservatory'. Citrus do not thrive (and may not survive) indoors, as our homes tend to be much too hot, much too dry, and not near bright enough. All citrus trees like humidity and cool-ish temps, ideally between 5° - 12°C with 7 to 8 hours of bright light in winter time. I keep my citrus trees in a greenhouse during the winter months. As the heating is super expensive, I keep it on the low end of the scale, at +5°C from November through till March. They love it, the cool, humid greenhouse keeps them flowering and fruiting all winter long. When I say that I set it at +5, that means the lowest temperature that it will go to. The temperature in the greenhouse will be higher in the daytime, usually, and on sunny days, of course, but it will not dip lower than +5. Also, even if it were to rise to +30 during the day, it is not the same as +18 inside the house. The greenhouse is always humid and airy, not tightly sealed as our homes. If our homes were moist like the greenhouse, we would have algae and mould growing everywhere. 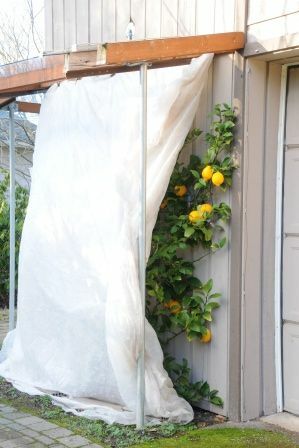 BUT.. How to over winter lemons, limes, and oranges without a bright sunroom or a heated greenhouse? Potted up trees are easy to move around from spot to spot, as needed. If your trees are large and the pots are heavy, you will want to consider how best to protect them before placing them in their winter home. While winter temps are above 0°C, leave them outside rather than inside the house … like on the front porch or doorstep, under the eaves, in an unheated hoop house or greenhouse, under some kind of roof or overhang to protect them from the winter rains. They do not like to sit in wet soil. A shed or garage is not a good idea as it would be too dark, unless you supplement with a grow light. Close to the house on the south or west side to soak up some of the heat from the siding is a great idea. I cannot find a picture of the home made version of the greenhouse I mention below, but this is very similar. You could buy something like this mini greenhouse, or build one, to put over your citrus tree in winter. Plug in the Christmas lights during cold nights and cold snaps, it will look festive and be perfectly happy in it’s warm little mini greenhouse. Use the greenhouse in spring for your seedlings. What to do with your tree if a cold snap threatens? Bring it in - If it is a smaller pot, simply bring it in for the night, or for as long as the cold snap lasts, then pop it back out again when temps are above 3°C. It can go in for the night and out for the day all winter long, if you have the patience for that. Unheated greenhouse or hoop house - Run an extension cord to your greenhouse. Inside the greenhouse have a small heater, or a light stand with a couple of 100 watt lightbulbs in it, or a strand of Christmas lights around each tree. Plug in when night time temps are going to dip lower than 2°C. On the porch, wrapped in Christmas lights. - Wrap your trees in old-fashioned Christmas lights, not LED as they emit no heat. Plug them in during a cold snap and wrap with a frost blanket (white fabric) to retain the heat by the tree. Build a shelter - I know people who have built a 3 sided wood framed little ‘greenhouse’ that fits in snug by the house. They plug in the Christmas lights and fit the little greenhouse around the tree, snug against the wall of the house. The wooden (or pvc) frame is covered with either poly or the white frost fabric. With the protection of the inexpensive ‘greenhouse’ and the lights turned on, the tree will stay cozy and warm without great cost. If you really feel that you have no options, the most tolerant citrus to bring indoors for the winter are Meyer’s lemons, Calamondin oranges, and kumquats. Keep away from drafty locations, heaters and vents, place in a bright window, in a cool room, on a pebble tray of water, mist often. This picture is a lemon growing outside in Saanich on southern Vancouver Island. This is Bob Duncan’s lemon tree, of Fruit Trees and More. Sour or acidic citrus, like lemons and limes are hardier, so can be grown in the ground here in our zone 7 and 8 gardens, with protection. Sweeter citrus, like oranges, need to go into pots as they require warmer temps to thrive. Grow your citrus on the southern or southwestern side of the house, in a sheltered spot. They do not like windy areas, so make sure to not plant in a wind tunnel. Citrus trees do not like wet feet, plant in well draining soil or build a small raised bed for your tree to provide great drainage. Plant under the eaves or build an overhang, as in the picture above, to protect the tree from our winter rains and to soak up heat from the side of the house. Wrap your tree in Christmas lights, the old fashioned kind, not LED as they emit no heat. Plug in lights during a cold snap and cover with homemade greenhouse as mentioned above for the potted plants, or attach frost blankets to the overhang, secure the bottom with rocks or weights of some kind, thus creating a nice cocoon for your lemon or lime. For more about general citrus needs and care, please see Part One HERE. Here on the Pacific North West, we tend to have fairly temperate weather, mild summers and winters. This works well for growing lemons, limes, and other citrus trees both in pots, and for some, even outside in the ground. Sour fruits, like lemons and limes are hardier and can be grown in the ground here in our zone 7 and 8 gardens, with protection, while sweet ones, like oranges, need to go into pots as they require warmer temps to thrive. To plant in the ground, you need a sheltered area with good, loose, rich soil and great drainage, a raised bed would be even better. Plant on the south or southwest side of the house, under the eaves or an overhang, close beside the house… this is not a tree to plant out in the open. Plant in an area that is sheltered from the winds. Citrus can be grown in pots quite easily. The best choices for pots are dwarf trees, like Meyers, Eureka, or Lisbon lemons. All citrus trees prefer clay/terra cotta pots over plastic, or even glazed ceramic ones. While I always knew they liked well draining soil and hated wet feet, I learned about the pots purely by accident. I had two #1 gallon Meyer’s Lemons left on the nursery sales floor one summer. I decided to keep one for myself and so potted it up into a nice clay pot, I have a thing for ornamental trees in clay pots. By the end of the summer, my lemon had more than doubled in size compared to the one still in the black plastic grower pot! I also had a Blood Orange tree in a lovely glazed pot, it looked nice enough but was not fruiting much nor growing. I soon switched it into a clay pot, and again it made a huge difference in how well the tree looked and produced. It began to thrive. So, plant in clay, they will thank you for it. Citrus do not like wet feet. Always use a good quality bagged potting soil with great either bark chips or perlite to provide good drainage, or both. I use 5 parts Organic HP Pro-Mix (the HP stands for high porosity) mixed with 2 to 3 parts of bagged manure or compost. Until you get to know your tree well, always check the soil before you water. Citrus prefer to be kept on the dry side to thrive, they do not like to sit in wet soil or poorly draining soil, but nor will they thrive in bone dry soil. Stick your finger into the soil, you want the top inch or two to be dry be before you water again. How often you water will fluctuate throughout the year. In summer, I water my potted trees quite readily, about every third day. Water thoroughly till water is flowing from the bottom and then go back a few minutes later and do it again. You want the water to really soak into the peat moss based potting mix, not just flow down the sides of the pot. Let the top inch or two dry out before you water again. In winter, it will depend on where you have your tree, the temps, and amount of sunshine. I grow mine in a heated, but cool (+5°C) , greenhouse on Vancouver island. We tend to have grey days, lots of rain, not so much sunshine. Therefore, I generally only water once every three or four weeks. If you keep the soil too wet, you will lose your leaves and possibly even your tree. Cold and damp is not a good combination. This winter has been a bit sunnier, it seems, and warmer, so I have been watering about every two to three weeks instead. As the days get longer and brighter, water more often. If you have yours indoors for the winter (more on winter care in part 2), it will likely require water more often in the warmth of the house. All citrus are very heavy feeders, they need lots and of nitrogen plus good amounts of both potassium and phosphorous to thrive. Apply an organic, slow-release citrus fertiliser for the best results, or if you cannot find a citrus food, use a 12-6-6 (or similar) slow release feed. In addition to the slow release, they will also benefit from a top dressing of manure in spring or early summer, as well as a few doses of a liquid or water soluble feed during the summer months. I also give mine a boost with a nitrogen and iron fertiliser occasionally, the liquid Garden Pro 5-0-0. Plant your tree in a pot that is just slightly bigger than the root ball, about 2 or 3 inches bigger. You do not want to go too big or the soil will stay too damp and you will get root rot. Up size every second or third year, as the tree grows. When you get to the size pot that you want to stay at, anywhere from 14” to 20” across, depending on your tree, you can just renew the soil in that same pot and root prune every 3rd year. Lift the tree out of the pot, add fresh, new soil to the bottom. To root prune, just pull off (with your fingers) about 1/3 of the soft feeder roots from the bottom of the root ball. Place your tree back into the pot and fill up the sides with fresh soil. Good to go for another 3 years. They will benefit from a pruning now and again for shaping and for stronger branching. Always remove suckers from below the graft, they are root stock and will quickly overtake your grafted tree. Remove dead branches, cracked, broken ones. Citrus will require a good 7 to 8 hours of sunlight, you may need to supplement with additional lighting if you are growing it indoors. They are just fine in a greenhouse, no extra lighting needed, even with our grey winters. They do not like windy locations. If planted outside, make sure that they are in a sheltered area, away from both summer and winter winds. Place pots out of the wind, they will dry out much faster and may drop their blossoms and fruits, too. They love the humid greenhouse in winter. The problem with our sealed tight houses in winter is that they are too dry and too hot. If, however, you have them indoors or in a sunroom, you can help add humidity by placing them on a pebble tray with water, top up regularly, and mist occasionally. Curling leaves and leaf drop are usually indicators of too little water. They do not like wet feet but they cannot go too dry either. You will get more fruit and better fruit if you water regularly. Leaf curl can also be an indicator of too much water. Confusing, I know. Over-watering washes out nutrients so you get yellowing leaves and root rot. Is hard to stop root rot, so always check the soil with your finger before watering. The top inch or two should be dry before you water again. Blossom drop is very normal. Your plant will generally make lots and lots of flowers. It cannot maintain all of the flowers and so will drop some. Little baby fruits that turn black or fall off are fruits that did not get proper pollination. Nothing to worry about unless you are losing lots of them. If you want, you can assist your citrus with pollination, in winter, by going from flower to flower with a small paintbrush or a q-tip. The most common pests that we encounter on citrus around here are soft scale, whitefly, and aphids. You may also get mealy bug or spider mites, but I have never had an issue with either of those. Soft scale.. see the picture above. To prevent scale, you want to shower off the foliage and the tree with a good strong jet of water every few weeks, especially the under sides of the leaves. It also helps to pop it outside for the spring and summer so that the birds and the beneficial insects can eat the bugs off. Do not place your citrus trees beside a Sweet Bay, should you have one, as they are also prone to scale. If you end up with scale anyways, you cannot just spray with a soap or oil, you will need to scrub it off as the wee little bug is hiding under that protective shell. Wipe the scale from the leaves with a cloth (they are usually on the undersides) and scrub the trunk and branches with a soft brush and warm, soapy water. They come off quite easily. Rinse off the soap well. I have also heard that baby bum wipes work well for cleaning the leaves. If you find ants on your tree, you have either aphids or whitefly. Both will secrete a sticky honeydew that the ants farm. To get rid of aphids, spray with a Safer’s product, either Soap, Trounce, or End-All. You will need to reapply several times. I blast my trees with a strong jet of water first to get rid of some of the bugs, then spray with the Safer’s product till dripping, leave on for 15 minutes, give it a shower to remove the soap residue and dead bugs, perhaps lingerers, too. Whitefly is harder as they fly about and do not wait around to get sprayed, but I use the same method as for the aphids. I never use the yellow sticky strips in summertime as it also attracts and traps bees, beneficial insects, and even birds. Save the sticky strips for monitoring purposes in the winter time. If you find a black powdery substance on your leaves, fruits, and branches, you have what is called Sooty Mould. This is a fungus that grows on the honeydew secreted by aphids or other bugs. The mould itself is unsightly but is not a big issue, just an indicator of a bug problem. Wash off the soot with warm, soapy water and a cloth or soft scrub brush. Then spray with a Safer’s product, as above, to get rid of the bugs that are making the honeydew. For information about HOW TO OVER-WINTER YOUR CITRUS, please see Part Two HERE…. Happy Gardening & Citrus Growing!